One of the biggest problems I can think of when it comes to being a homemaker is organization. Whether it's organizing toys that get played with everyday, stuff that stays stored most of year or the food in the refrigerator that needs to be used before it spoils, organizing is just a fact of our life at home. This post was inspired by my in-town friend, Barb. I wanted to show her some of the organization going on over here and how I tackle what I think is one of the biggest hurdles in organization... using space efficiently. Closets are some of the biggest space wasters. Oh sure, you can go to a contain everything store and have them design you a perfectly organized closet that utlitizes every inch of available space but that's probably not going to happen for most of us whether it's because of finances or simply the fact that our needs change pretty rapidly and our closets have to be flexible (or the fact that those stores are like catnip for moms and should be avoided to save husbands from having to call out the search and rescue teams). One area that I know is a huge space waster is the top of the closet. It's not easily accessible enough to use for everyday storage space and you can only pile stuff up so high before it comes tumbling down on top of you. I call it a shelf hutch. I'm sure there is a professional term out there and probably an official trademarked thing that is sold in that Can't Contain Yourself place. I think I got these at the local Bullseye store a long time ago and repurposed them when we moved here. One of these 3-shelf storage organizers will make two hutches if you use the inner dividers as outer legs. Does that make sense? Something like this might work too. 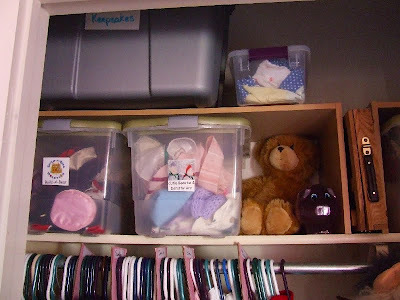 The new top shelf is used for keepsake boxes that don't come down very often and below can be used for accessible storage that my kids can reach themselves. Obviously, if your little ones are still very little, that's not going to work for them. You might consider using it for clothes storage while putting their toys on the bottom of the closet. Below is our front hall closet. We've had the shelf hutch there for a while helping with paper and puzzle organization. Then I came up with an idea for storing our monthly feast day celebration statues, knick-knacks, mantle decorations, candles, etc.... 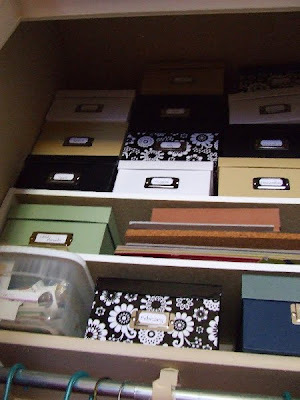 I purchased 12 photo storage boxes like these in assorted designs from the craft store and labeled one for each month. If you need bigger boxes, look for CD & DVD storage boxes. I packed up everything that is specific to that month's liturgical days. I pull the current month's box down and leave it more easily accessible on a lower shelf with the other boxes stored up higher. I love this system because it puts a limit on what I can save. If I can't store it in the box, then I have to pare down. I don't yet have all of the boxes packed with everything I might want them to hold (I expect that to take a full year plus) but you can see here what it looks like in our July box. Our chalice and prayer to the Most Precious Blood along with our St. Anne holy card and display stand. I have room to add some seashells and the black lace, too. Some statues, like the St. Anne statue we like to keep out all the time, but others, like our St. Nicholas and St. Patrick can go in the boxes for rotation keeping them fresh and new. Now an open bin can work for us provided it has a closed space to reside in like the ones below. I am a firm believer in labels even for see through containers and especially for closed containers. I don't own a label maker mostly because I like to print them up myself. They can be functional and pretty too! The ones below are attached with Velcro sticky-back tape so that they can be changed up should the contents of the bins change. All of the children, but BigBoy especially, love knowing where to find their toys and also where they go when it's time to clean up and that makes all the difference in my little guy's attitude and cheerfulness when asked to do his chores. P.S. This post isn't intended to claim that I have organization mastered or to make anyone feel bad who is still struggling to find what works for them. Simply to offer a glimpse at what works for us now, what hasn't in the past and what we've learned from it. I have mine in big Rubbermaids in the attic. I use spray glue and sharpie on index cards for labels. I try to keep each month in 1 rubbermaid - except Christmas. With Texas summers as hot as they are, we have to be careful what goes in the attic. We definitely use it for bigger storage items that are more seasonal in nature. Wonderful post Charlotte! Thanks for sharing! I especially love your LIturgical Boxes! I've been wanting to do something along those lines, and started using plastic containers, but the Photo Boxes are so much prettier and look so much neater labeled rather than see through. Thanks for the inspiration!!! I am a long time lurker of your blog. I'm a new mom (to 9 month old boy). I'm not Catholic, but an Orthodox Christian. As I read yours and other like minded blogs I aspire to do so many of these wonderful things. I love so many of your ideas and always think up ideas for incorporating them to meet more of an Orthodox Christian home and life. 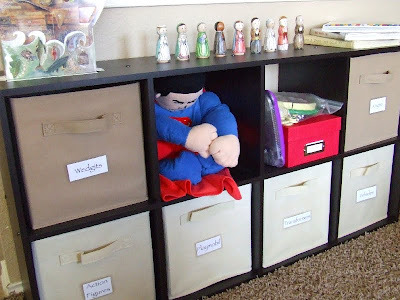 I really liked your photo box storage idea for your liturgical shelf. I don't yet have/use a liturgical shelf for my little guy, but we do have a large icon corner in our home. I think I might go ahead and start cleaning and organizing it to be more seasonal and use these boxes for it as well. We have lots of other icons that I try to get out during their feast days, but I inevitably forget. This may be a great way to help remember what I have available. How do you store things that are for moveable dates like for Easter or Pentecost? These are some great ideas! The closet shelf will work great in my boys' rooms! Thanks. Congratulations on your sweet boy! If you haven't discovered it already, take a peek at Mary's blog. Regarding Easter and Pentecost storage... I have a separate box for Easter that is a larger, Rubbermaid variety. It stays in the garage until we need it. I also have a separate photo box in that closet for our Alleluia letters because they get hidden there during Lent. For Pentecost, it usually falls in May and very rarely gets pushed to June. I don't have too much right now for Pentecost, so I put what I have into the May box and just figure that if Pentecost happens to fall in June, it'll be available a little early. Charlotte, I can't tell you how much this post has helped me! Since deciding to try harder at reflecting the rhythms of our Church at home, I've accumulated a lot of clutter...and it's driving me nuts! I already use the box principle for Christmas decorations--now I will do the same with liturgical boxes. Thank you!!! As you pack the liturgical boxes for each month, would you consider sharing a snapshot of their contents? I would love to know what I should be casually looking for during the rest of the year. I just discovered those fabric boxes and matching shelves a couple of months ago. I love them! If you watch the tar-jay ads, they go on sale regularly which makes them a pretty good deal. I have some in our playroom, with a different color bin for each child. Oh I just knew you'd have the answer! This is a great idea, I love the boxes. I started out using file folders, but, where to sore larger items. I'll have to look into trying this. My biggest A-Ha moment came from the notion that I am not using the top shelves of my children's closets. Mainly because it's a pain in the bottom for me, the 5-foot momma, but why not stick the seldom-used stuff up there like puzzles & whatnot? So thank you for that, Charlotte! This is a wonderful post. 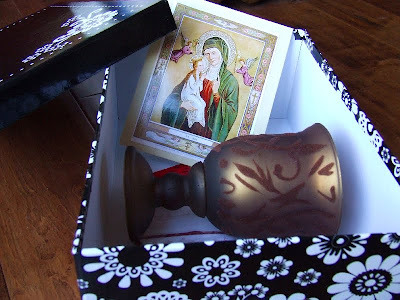 Love, love, love the liturgical boxes idea! I was just starting to feel good about how I was using the tops of my closets and then we moved and I now have to start over. I even planned to post about it :) Maybe I'll get around to it now, with you as motivation!